I live in a place where people have serious opinions about chili. Proper Texas chili should have meat and chiles and not much else. And, here I am, a devotee of vegetarian chili. Blasphemy, I know. My preferred chili has lots of beans, some tomatoes, there might even be some chunks of eggplant or zucchini, possibly fresh corn kernels, and of course chiles. Years ago, I tinkered with ingredients over and over in an attempt to create the ultimate vegetarian chili. I eventually got it to a point where I really liked it, but no one else did. So, I was excited to try the Smoky Chipotle Black Bean Chili from The Fresh and Green Table . It’s one of those recipes with a dauntingly long ingredient list, but eleven of those ingredients are dry spices so it's not really so scary. It also comes with two suggestions for salsas to serve on top. There’s a Roasted Winter Vegetable topping and a Summer Vegetable Salsa which is what I used. 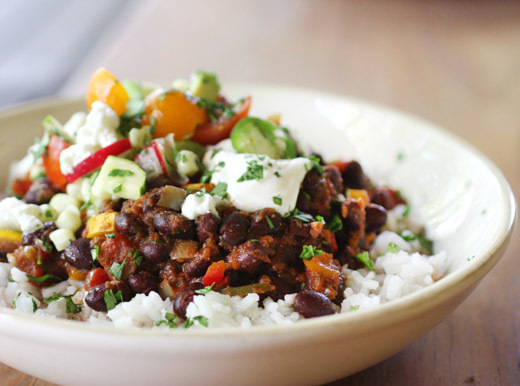 It’s also suggested that the chili be served with a white rice pilaf, and some ideas for garnishes are crumbled goat cheese, sour cream, pepitas, and lime wedges. This is a good, thick chili with many layers of flavor and just enough heat. Let me run through the list of those eleven spices: ground ancho chile, ground coriander, ground cumin, Mexican oregano, paprika, brown sugar, unsweetened cocoa, ground chipotle powder, ground cinnamon, ground cloves, salt. Additional flavor came from red wine, chopped cilantro, and chipotles in adobo sauce. All of those ingredients were measured and set aside before cooking began. To start the chili, butter was melted and olive oil was added to a pot over medium heat. Chopped onion, bell pepper, and some salt were added. After the onions were lightly browned, minced garlic and chopped jalapeno were added. Next came the mix of dry spices followed by a mix of red wine, cilantro, chopped canned chipotles, and tomato paste. The vegetables and spices were cooked, and the bottom of the pan was scraped, and then a mixture of canned tomatoes and water was added. I also added some chunks of summer squash just because I had some. After stirring everything together and scraping the bottom of the pan again, the soup was simmered for about 20 minutes. Then, canned black beans that had been rinsed and drained were added. Last, more cilantro was added. While the chili was simmering away, I cooked some rice with minced onion and added chopped cilantro. Also, I prepped the Summer Vegetable Salsa made with halved cherry tomatoes, avocado chunks, chopped zucchini, fresh corn kernels, sliced radish, and cilantro. The vegetables were tossed with a mix of olive oil, orange juice, lime juice, honey, and salt. I served the chili on white rice pilaf with the salsa on top and garnished it with sour cream, crumbled goat cheese, and sliced jalapeno. The mix of spices used here is exactly what my previous attempts at vegetarian chili needed. In the finished dish, it’s hard to pick out the cocoa powder or any one of the other spices or even the red wine specifically, but all of those flavors came together beautifully. This might not be Texas chili, but this is definitely my kind of chili. A scrumptious rice dish! Healthy and extremely flavorful. Sounds and looks yummy. I was surprised to see some of the ingredients. Loving this dish! The combination of flavors are making my mouth water. Great photo of the dish. Hope you have a great week. What a great summer chili! I usually think of chili as a cold weather food, but this looks great. I love the photo of all the spices, too. The dish sounds amazing. Although I've never tried chipotle beans I know that I would prefer them without meat. Lisa this chili looks and sounds fantastic. Vegetarian chili rocks!! Lisa, that has got to be the most gorgeous bowl of chili I've ever seen! I love that you put it over rice with all those yummy veggies. And chipotle really puts it over the top! Unknown: I don't reprint copyrighted recipes from books without publisher's permission. Love all the spices used here for the exploding flavors. Looks great! Although I love meat chili, veggies varieties are my fav (particularly made with sweet potatoes - the combo of hot chile powder, beans, and sweet potatoes is magic). Nice post - thank you. You had me at chipotle. That is my absolute favorite spice, I don't know what I would do without it. That is my favorite kind of chili too! Looks terrific Lisa! Lisa this is a wonderful dish. I adore chilli and all things spicy and smoky so this is right up my street! Beautiful pictures - what is the violet coloured vegetable is it aubergine/eggplant? Our aubergine is a lot darker (deep purple) so I wasn't exactly sure if it was the same thing. Jacqueline: The purple vegetable is a bell pepper. I had just brought home some peppers from the farmers' market. They were all different colors. 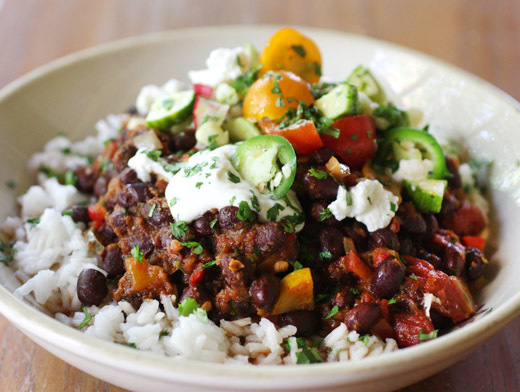 though i love me some meat, i'm with you on this one--beany chili is the way to go. what a gorgeous display of comfort food, lisa! I love your version of chilli! Looks very flavourful and healthy. I am always searching for meatless dinner ideas that have lots of flavor. 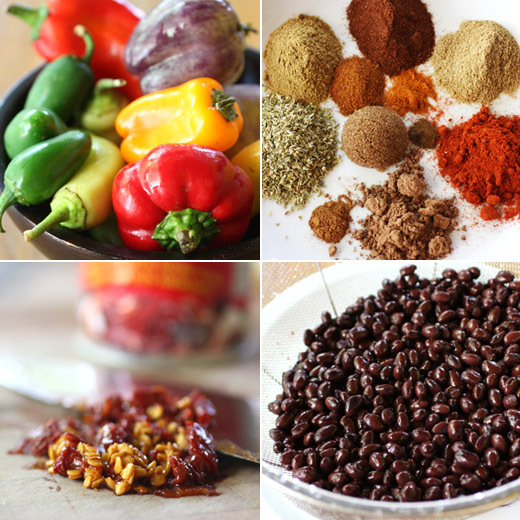 The Black Bean Chili is a fabulous idea! I can prepare the chili for the crock-pot the night before, turn on low in the morning and have dinner ready in the evening. Salsa and goat cheese are the perfect pairing! I don't do well in places that have serious opinions about specific foods. That's because I like it all. Ha, ha! I refuse to argue about the best chili, bbq or pie when they are all tasty. :) This chili is exactly what I'm craving. It says fall, but still holds on to a bit of summer! I love black beans and all those spices make this sound amazing! Thanks Lisa for your many bean recipes. I am a lowfat/non fat vegan and your comination of beans, spices, and other vegs helps me broaden my palate. I also liked the snow capped bean dish.